A first glance taunted a comparison with Tracy Chapman. However, once I got over the dreadlocks and the guitar and got into the groove, I quickly realized that there was something far deeper in the soul searching vibes, something far more cultural than the fact that she sings in Yoruba. As I started to get comfortable with her flow, I made a second attempt to define Asa… Songs like Soul (featuring silver saddih), Fire On the Mountain, No One Knows, Burn, Jailer and even Eyin Mummy threw me off completely. I found myself right back at square one, left with nothing but respect and admiration at the sheer depth and breadth of her musical expression. In a kinda bluesy, Jazzy, finger snapping way, Ilu (Nation) challenges our leaders and asks them what they have done with our great country. She reminds us of a time when the Naira was stronger than the dollar, of a time when police checkpoints were unheard of. “Dollar je Naira lowo… Ko si wetin you carry”. – Fela would be proud! I had to remind myself to breathe while listening to Eye Adaba (Birds in the sky). Her rendition in English of the same exact song was a fresh experience that was just as amazing as the original. (I wan craze!). Mama (mother)/So Beautiful, a slow dance in honor of her mother highlights the sacrifice, selflessness and pricelessness of motherhood. I think I now have enough songs for my “Sweet Mother” mixtape. MAJOR brownie points coming my way on mother’s day! Iba (praise) brings it back to earth by giving thanks & praise to Heaven for all the things we tend to take for granted. I’m not sure if it’s the sincerity in Bibanke (When I cry), the high from soaring with the birds, the rain outside or the vodka inside but um… Asa… will you marry me? 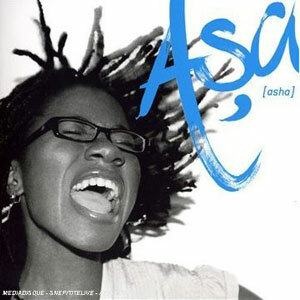 Asa has seriously raised the bar and set the standard in the “Yoruba Acoustic Soul” category. Could I have some ogi to accompany these 5 Akaras please!? This CD is available HERE .